If you want to drop body fat, you need to reduce the size of your fat cells. When you get lean, you don't actually get rid of fat cells. You just shrink them. Unless you get liposuction, you're stuck with the fat cells you already have. Getting fat to leave your cells is the first step to getting leaner, but it's only 1/3 of the equation. If it's not used for fuel, fat can actually go back into your fat cells and get stored again! To prevent this from happening, you have to push fat into your mitochondria, which are your cellular power plants. The mitochondria take fat, carbs, and the breakdown products of protein and convert them into usable energy in the form of adenosine triphosphate, or ATP, which your muscles use to contract during exercise. The problem with most stored and dietary fat is that it needs to be escorted into the mitochondria. When you follow a fat-loss diet, work out, and use fat-burning supplements you generate more freed-up fat than normal. This overloads the typical transport system, which prevents some of that fat from reaching the mitochondria. To ensure long-term weight loss, you have to crank up your body's energy requirements to make your mitochondria burn more fat for fuel. The simplest way to do this is with exercise. Exercise makes your mitochondria burn up more carbs, fat, and protein to produce more ATP. Exercise also helps you burn more calories at rest, at least for several hours after a given workout is over. 6 research-backed ingredients provided in their proper doses. 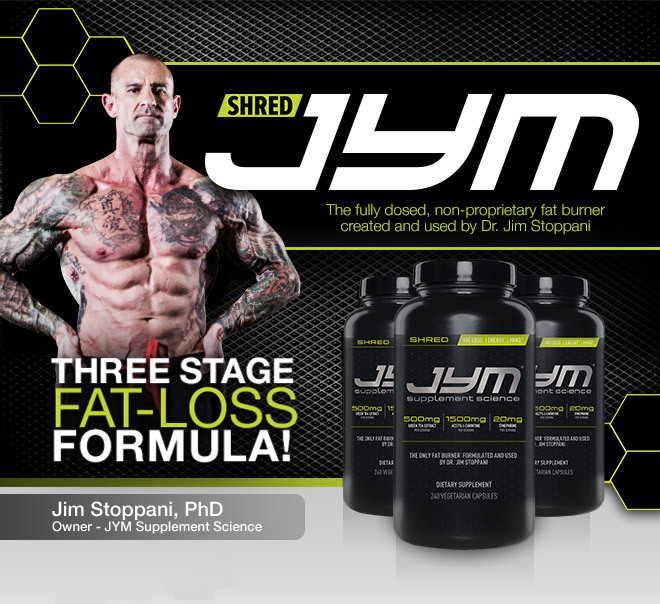 Let's get out the microscope and take an even closer look at some of the ingredients and doses used to make Shred JYM a safe and effective fat burner. The most critical role that carnitine plays in the body is helping transport fat across the mitochondria of cells. The mitochondria are essentially all cells' power plants, where the majority of adenosine triphosphate (ATP) is derived for energy. Once fatty acids pass into the mitochondria, they can be oxidized ("burned") to generate ATP. Without adequate carnitine, most dietary fats cannot get into the mitochondria and be burned for fuel. One problem with consuming hot red pepper extract is that it is extremely spicy. Many people cannot tolerate the "heat" from hot peppers, which irritates the mouth and gastrointestinal tract. Capsimax® uses technology to avoid the irritation but deliver the benefits of capsaicin. Buzzigoli, G. and Ferrannini, E. Effects of acute hypercarnitinemia during increased fatty substrate oxidation in man. Metabolism 42(5):594-600, 1993. Cavallini, G., et al. Carnitine versus androgen administration in the treatment of sexual dysfunction, depressed mood, and fatigue associated with male aging. Urology. 2004 Apr;63(4):641-6. Malaguarnera, M., et al. L-Carnitine treatment reduces severity of physical and mental fatigue and increases cognitive functions in centenarians: a randomized and controlled clinical trial. Am J Clin Nutr. 2007 Dec;86(6):1738-44. Borchardt, R. T. and Huber, J. A. Catechol Omethyltransferase. Structure- activity relationships for inhibition by flavonoids. J Med Chem 18: 120-122, 1975. Dulloo, A. G., et al. Green tea and thermogenesis: interactions between catechin-polyphenols, caffeine and sympathetic activity. Int J Obes 24: 252-258, 2000. Kao, Y. H., et al. Modulation of endocrine systems and food intake by green tea epigallocatechin gallate. Endocrinology 141: 980 -987, 2000. Harada, U., et al. Effects of the long-term ingestion of tea catechins on energy expenditure and dietary fat oxidation in healthy subjects. J Health Sci 51: 248 -252, 2005. Diepvens, K., et al. Effect of green tea on resting energy expenditure and substrate oxidation during weight loss in overweight females. Br J Nutr 94: 1026-1034, 2005. Shimotoyodome, A., et al. Exercise and green tea extract stimulate fat oxidation and prevent obesity in mice. Med Sci Sports Exerc. 37(11):1884-92, 2005. Kerksick, C., et al. Changes in muscle damage markers, soreness, and strength after a 14-day prophylactic period of antioxidant supplementation followed by eccentric exercise. The Journal of Strength and Conditioning Research: Vol. 20(4):e21, 2006. Rasheed, Z., et al. Green tea polyphenol epigallocatechin-3-gallate inhibits advanced glycation end product-induced expression of tumor necrosis factor-alpha and matrix metalloproteinase-13 in human chondrocytes.Arthritis Res Ther. 2009;11(3):R71. Henning, S. M., et al. Bioavailability and antioxidant activity of tea flavanols after consumption of green tea, black tea, or a green tea extract supplement. Am J Clin Nutr. 2004 80(6):1558-64. Green, R. J., et al. Common tea formulations modulate in vitro digestive recovery of green tea catechins. Mol Nutr Food Res. 51(9):1152-62, 2007. Yoshida, T., et al. Relationship between basal metabolic rate, thermogenic response to caffeine, and body weight loss following combined low calorie and exercise treatment in obese women. Int J Obes 18: 345-350, 1994. Beck, TW, Housh, TJ, Schmidt, R, et al. "The acute effects of a caffeine-containing supplement on strength, muscular endurance, and anaerobic capabilities." Journal of Strength and Conditioning Research, 2006, 20(3), 506-510. Hudson, GM, Green, M, Bishop, P, et al. "Effects of caffeine and aspirin on resistance training performance, RPE and perception." Poster presented at ACSM Annual Meeting, May 30-June 2, New Orleans, LA. Del Coso, J., et al. Caffeine-containing energy drink improves physical performance of elite rugby players during a simulated match. Appl Physiol Nutr Metab. 2013 Apr;38(4):368-74. Motl RW, O'Connor PJ, Dishman RK. "Effect of caffeine on perceptions of leg muscle during moderate intensity cycling exercise." J. 2003 Aug;4(6):316-21. Echeverri, D., et al. Caffeine’s vascular mechanisms of action. International Journal of Vascular Medicine, 2010. Umemura, T., et al. Effects of acute administration of caffeine on vascular function. Am J Cardiol. 2006 Dec 1;98(11):1538-41. Duncan, M. J. and Hankey, J. The effect of a caffeinated energy drink on various psychological measures during submaximal cycling. Physiol Behav. 2013 May 27;116-117:60-5. Spence, A., et al. A Comparison of Caffeine versus Pseudoephedrine on Cycling Time-Trial Performance. Int J Sport Nutr Exerc Metab. In press, 2013. Del Coso J, Caffeine-containing energy drink improves sprint performance during an international rugby sevens competition. Amino Acids. 2013 Jun;44(6):1511-9. Deijen, J. B. and Orlebeke, J. F. Effect of tyrosine on cognitive function and blood pressure under stress. Brain Res Bull. 1994;33(3):319-23. Owasoyo, J. O., et al. Tyrosine and its potential use as a countermeasure to performance decrement in military sustained operations. Aviat Space Environ Med. 1992 May;63(5):364-9. Kawada, T., et al. Some pungent principles of spices cause the adrenal medulla to secrete catecholamine in anesthetized rats. Proc Soc Exp Biol Med 188: 229-233, 1988. Watanabe, T., et al. Adrenal sympathetic efferent nerve and catecholamine secretion excitation caused by capsaicin in rats. Am J Physiol Endocrinol Metab 255: E23-E27, 1988. Yoshioka, M., et al. Effects of red pepper on appetite and energy intake. Br J Nutr 82: 115-123, 1999. Bloomer, R. J., et al. Effect of oral intake of capsaicinoid beadlets on catecholamine secretion and blood markers of lipolysis in healthy adults: a randomized, placebo controlled, double-blind, cross-over study. Lipids Health Dis. 15;9:72, 2010. Stohs, S. J., et al. A review of the receptor-binding properties of p-synephrine as related to its pharmacological effects. Oxidative Medicine and Cellular Longevity, 2001. Stohs, S. J., et al. The safety of Citrus aurantium (bitter orange) and its primary protoalkaloid p-synephrine. Phytotherapy Research, 2011. Seifert, J. G., et al. Effect of acute administration of an herbal preparation on blood pressure and heart rate in humans. International Journal of Medical Sciences 8(3):192-197, 2011. Stohs, S. J. and Preuss, H. G. Stereochemical and physiological differences between naturally occurring p-synephrine and synthetic p-synephrine. Journal of Functional Foods 4:2-5, 2012.